With the Associated Press calling the Democratic presidential race for Clinton, and the polls for the last primaries in her favor, you might think that there's nothing that could derail her campaign. But there is. It may be a long shot, but it's definitely something Sanders supporters have been praying for as a last-minute Hail Mary: an indictment from the FBI over the private email server Clinton used while secretary of state. The FBI is currently investigating the matter, and if they find evidence that she broke the Espionage Act, they could prosecute. So what happens if Hillary Clinton is indicted? At this point, only a few diehard Sanders supporters — and some on the right — see this as a possibility. H. A. Goodman, a Huffington Post columnist and Sanders supporter, laid out his case for Clinton's indictment Monday, arguing that she inadvertently broke the law by transferring 22 top-secret emails to her private server, even though they were not marked classified when they were first sent back in 2008. He argues that "'gross negligence' is enough to prosecute," especially in light of the State Department's report that Clinton did not have approval for the private server and was in conflict with new rules put in place in 2009, when she took office. That would thrill some Sanders-or-bust supporters. The New York Times ran a piece on them, noting that some would even vote for Trump over Clinton. Others promised to vote for a third-party candidate. What they had in common was a hope that an FBI indictment would hand Sanders the nomination. But it's not that simple. Even if Clinton is indicted, that doesn't mean Sanders would become the Democratic nominee. Part of it would depend on the timing of the indictment. The Hill reported that the FBI is expected to wrap up its investigation soon, but there's no guarantee that will happen before the Democratic National Convention in July. FBI Director James Comey told The Niagara Gazette last month that he's ensuring the investigation has the necessary resources to be performed "competently." But that could take time. "The urgency is to do it well and promptly," Comey told the paper. "And 'well' comes first." If the FBI were to indict Clinton before the convention, she would likely withdraw her name for the party's nomination — but she wouldn't have to. Either way, this would probably give superdelegates the pause that Sanders has been hoping for since he first uttered the words "contested convention." The problem is that superdelegates might not look to Sanders next. The party could always put forward a third person. That's what Mark Jones, a fellow at Rice University's Baker Institute for Public Policy, predicted when speaking to The Washington Examiner in February. He offered Joe Biden, Elizabeth Warren, and former Massachusetts Gov. Deval Patrick as possibilities. Now that Sanders has won so many delegates, that's more of a long shot, but not so much that Sanders hasn't been asked about it. Just weeks ago, he told the hosts of The Young Turks that it would be a "terrible idea" to give Joe Biden the nomination in such a situation. After the first round of voting, pledged delegates would be free to support a party favorite. Sanders would need to wrap up enough superdelegates in the first round of voting to prevent this. Then there's the scenario in which Clinton is indicted after securing the nomination. There is no law that would require that she drop out of the race. Michael Mukasey, former attorney general under George W. Bush, told The Washington Examiner that there would be no reason for her to drop out, legally speaking. "The Constitution lists the qualifications for the presidency. And if you add anything else, it would be unconstitutional." That means Clinton could continue on, looking toward November and hoping that the email controversy subsides. 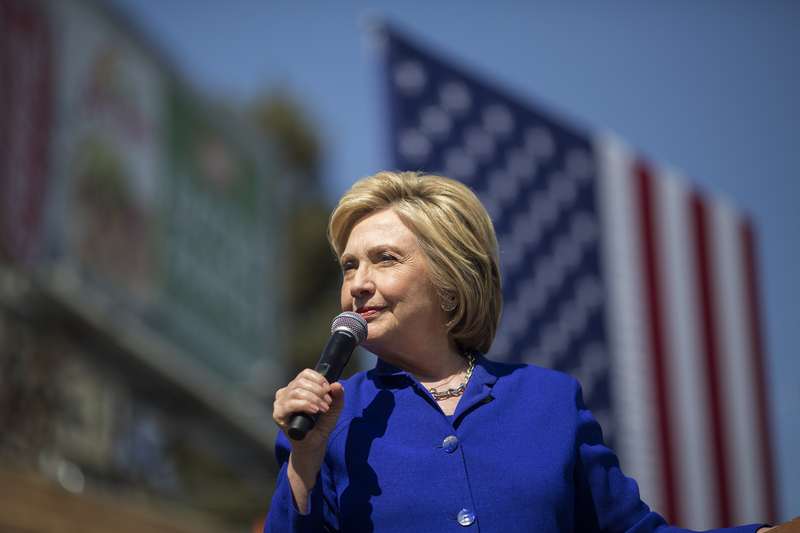 Some 71 percent of Democratic voters think that she should fight on even if she's indicted. A full half of all voters agree. No one could force her out after she is officially voted in as the nominee. She could drop out of the race, though. Even though it has never happened, there are rules in place in the event that a candidate withdraws their candidacy. The party's bylaws dictate what happens in this kind of situation, and once again, it may not be good for Sanders. Essentially, the party chooses — the same party that Sanders has been railing against for much of his campaign. In the case of a vacancy on the ticket, the National Committee Chair, Debbie Wasserman Schultz — Sander's favorite, remember — would call a special meeting, and the committee would vote on a replacement, assuming they reached a quorum of 50 percent. They wouldn't be forced to choose Sanders, and they might opt for someone like Biden, or give Clinton's VP pick a boost. There are rules governing the pick, but not precedent. All in all, an indictment would be a huge issue for the Democratic ticket — and it might not help Sanders at all. His supporters on the #NeverTrump train should take this into consideration. And for those who aren't, maybe the accusations of fraud facing Trump University will cancel out concerns over any possible indictment.